I love finding storage that works for my home, not only in terms of functionality, but also for look and feel – so I am particularly fond of baskets. Not only do they provide the storage I need, but they also look great while doing it! 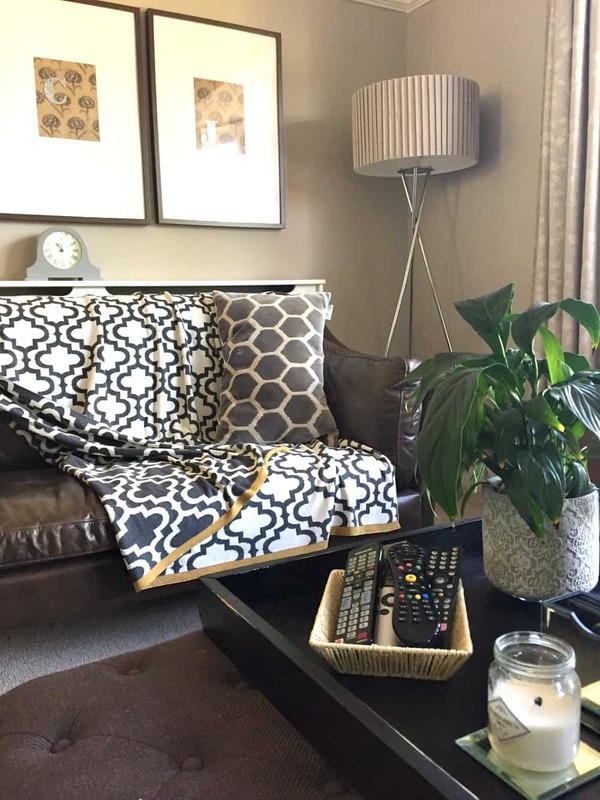 They add a bit of texture to my neutral home, and they can be bought in pretty much any size and shape to fit what I need. So today, I wanted to look at a few ways that I use baskets around my house, and a couple of ways I’m going to try soon! – hopefully all of which will give you some inspiration to use them too! 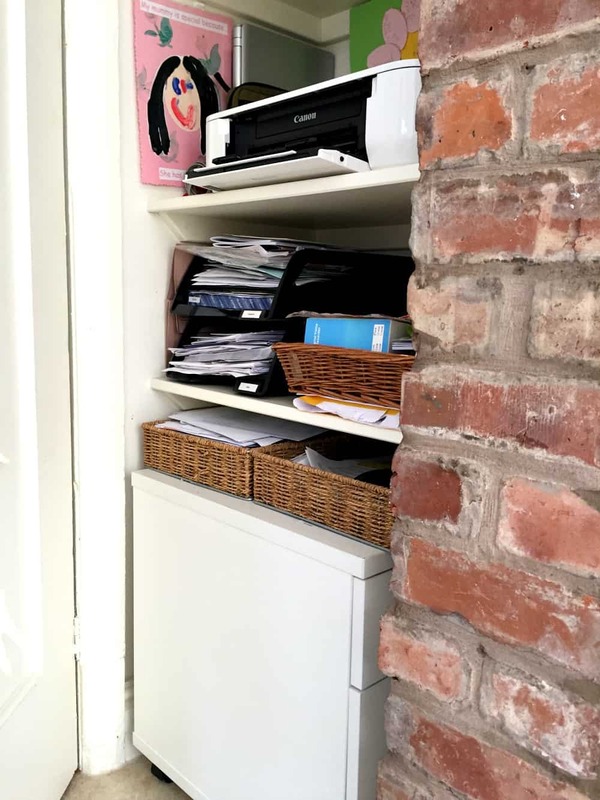 I love using baskets for toy storage, because they are easy for kids to use as well as adults, making them a great option that will hopefully make tidying up quick! I have used 2 different types of storage for toys over the years, a large open basket and a trunk with a lid. For smaller children, a large basket is a great option as they can grab what they need really easily, and throw everything back when finished. It takes minutes to clear the room, and the basket can be tucked away in the evening when it’s adult time. For older kids (and for storage that you want to be hidden), a trunk is a great option. It can be placed in the side of the room, or even used as a footstool or coffee table as well! 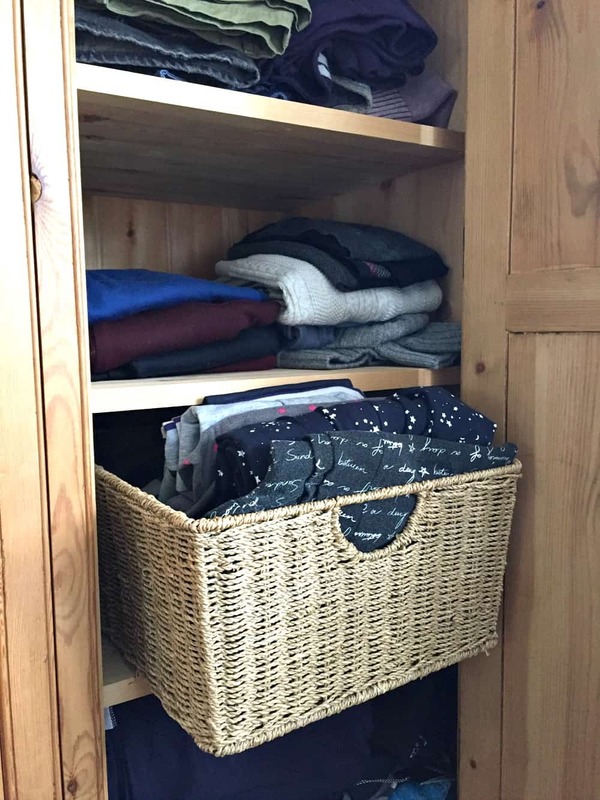 Using a basket style laundry basket is a perfect idea because it allows air to flow around the items! I have a simple narrow basket that works well in our space. Most have liners as well so that clothes don’t catch on any parts of the basket that they shouldn’t. TIP – Get a basket that’s the right size for your homes needs. Not too big, otherwise you will be tempted to let washing build up, and not too small otherwise you will have unsightly overflow…. I love using small baskets for lots of things around the house, especially containing small items that are similar. I currently have my remote controls in our lounge all kept together in a shallow basket which looks much nicer than them all being left anywhere, and I have used baskets for hair items in my daughters room, pens in my kitchen, and even paperwork in that area as well (my daughters school and clubs info goes in a tray each week so we know where to find it). I have a large wardrobe that has shelving on one side. This is great, but not very useful for storing my clothes easily. As such, one day I found an old basket that fit perfectly in that area and so I filled it with clothes (filed!) and now I can simply pull the basket out, choose what I need, and put the basket back. This makes the space so much more useable. 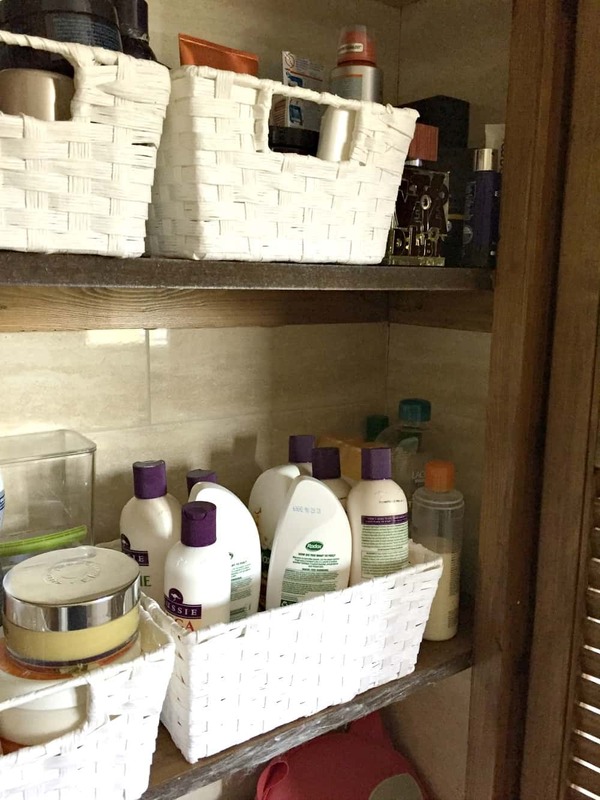 Toiletries in homes tend to be bought in bulk, and are quite small in size, so it makes perfect sense to use baskets to contain each type of thing together, so that you can grab them quickly when needed. In my own bathroom cabinet I have used various baskets that fit perfectly for all those bits and bobs, and it works really well. 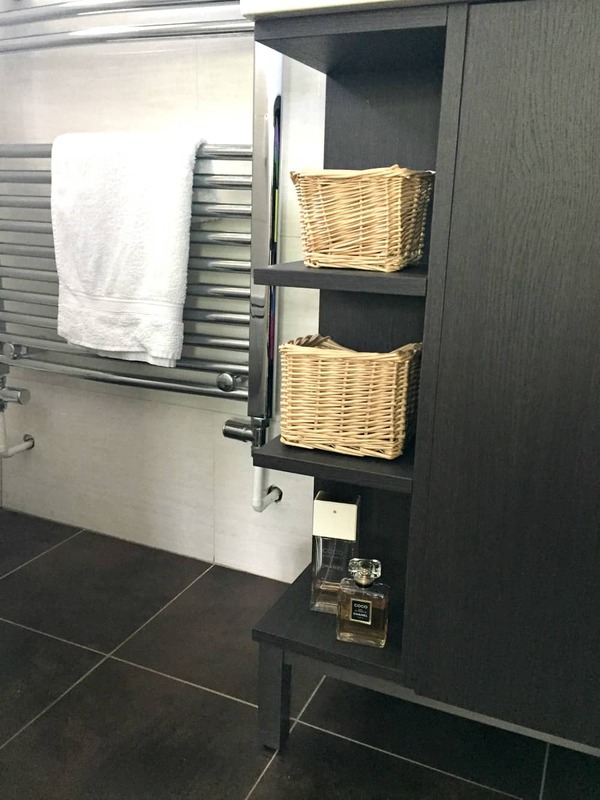 I have also used small baskets in my ensuite on the side open compartments so I can use these areas as extra storage but not have everything on show. It also contains the dirt really well! 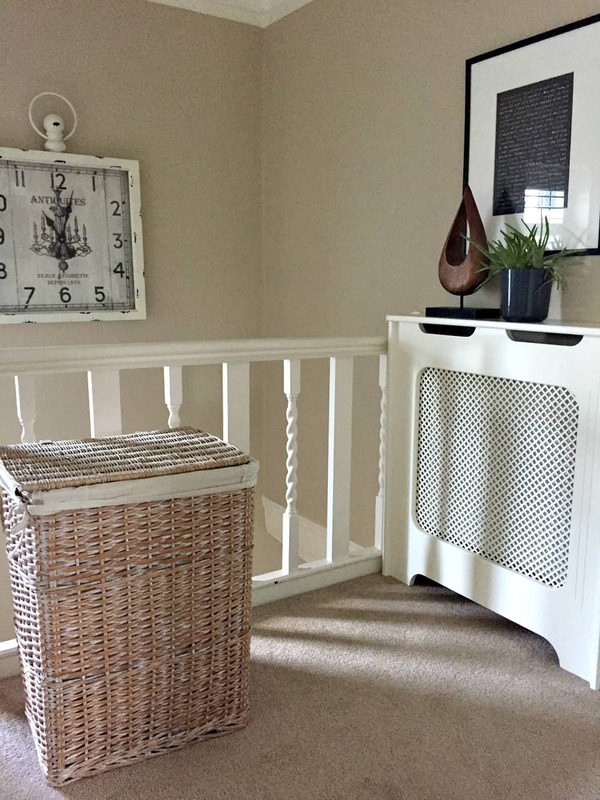 Lastly – where it’s not always possible to use a proper item of furniture, you could use some baskets instead. I use a set of baskets for a sort of decoration in the bay window in my Master bedroom, as they look so much nicer than any proper furniture. I keep my hair dryer and various larger more awkward shaped items so I can grab them easily when needed. 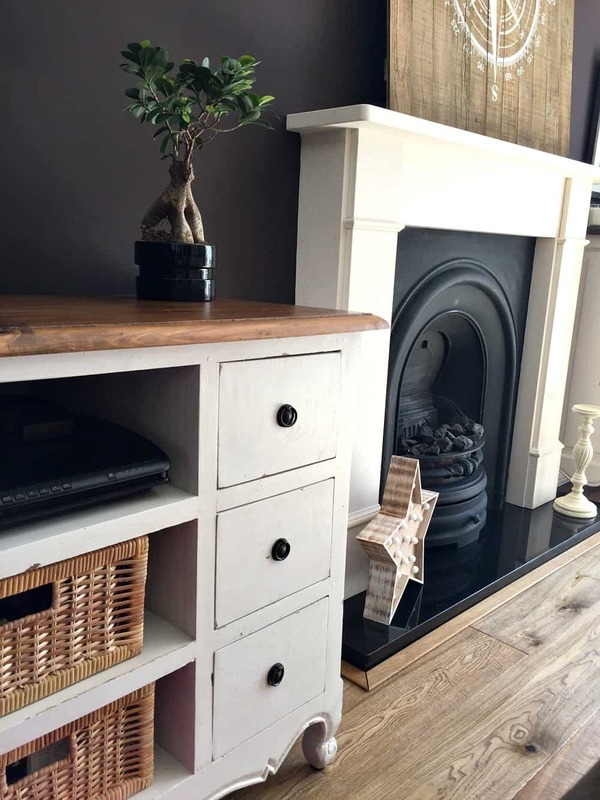 I love this idea if you are constantly moving things up and down the stairs. It keeps everything in one place, and has a handle so you can grab it when you walk upstairs easily. 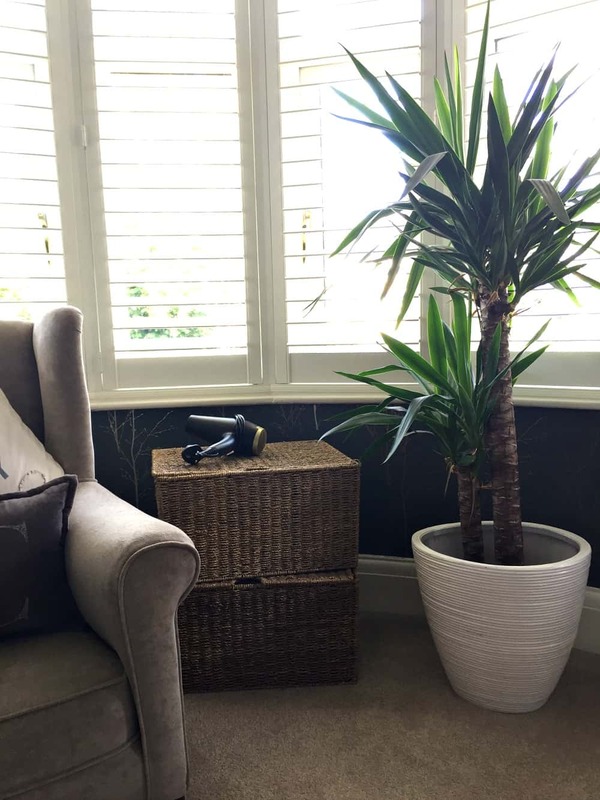 Wicker looks gorgeous with greenery, so you could make a great display with pots either inside OR out (hanging baskets are commonly used for displaying/storing plants and flowers so this would be just taking it one step further!). 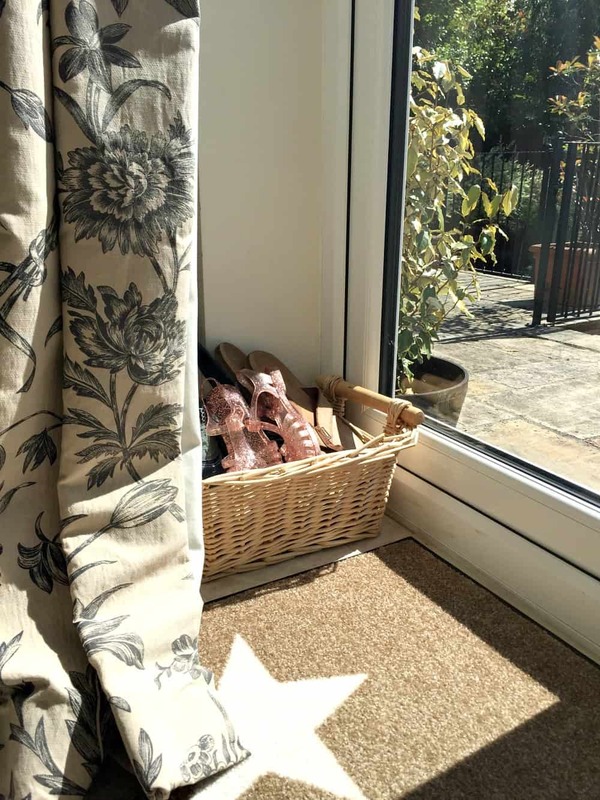 There you have it – as you can see, I LOVE baskets of all shapes, sizes and colours – and there are ways to use them in pretty much every area of your home. 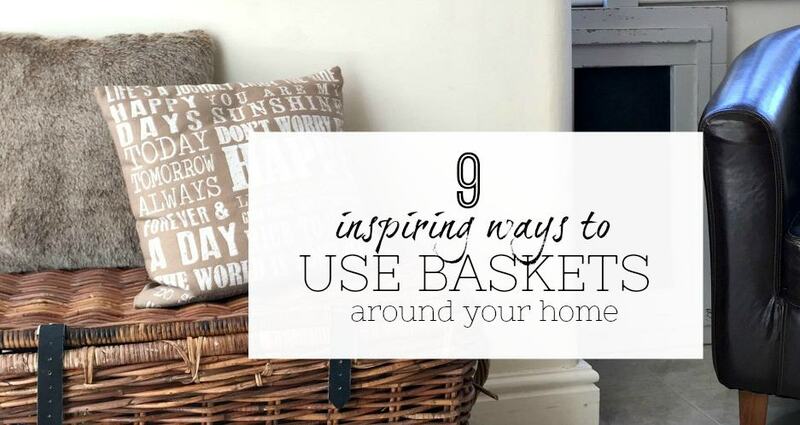 Hopefully this has inspired you to try out baskets as storage in your home, and I’d love to know how you get on! Do you already use baskets? If so, where? – leave a comment and let me know below….. 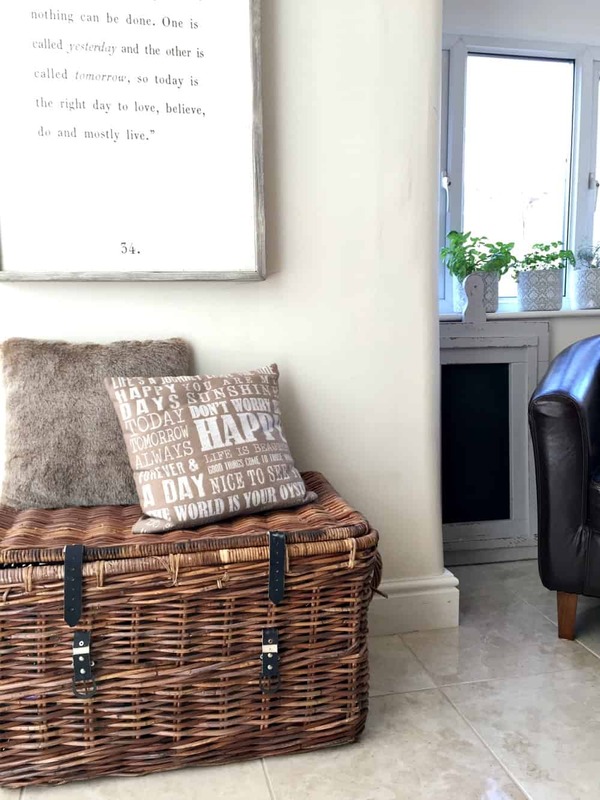 This post was written in collaboration with The Basket Company who have an extensive range of wicker baskets in all shapes, sizes and colours in willow, rattan, water hyacinth, seagrass & more. They pride themselves on their great products and exceptional customer service and are offering 15% discount on everything exclusively for Organise My House readers. Just enter the discount code OMH15 at checkout. As always, all opinions and words are my own and are in no way altered by the collaboration. You can find more information about The Basket Company by clicking HERE. Wonderful article, just a couple quick notes on the baskets themselves… ALL natural baskets not only can, but should be washed occasionally. It not only cleans them up, but helps keep the weave tight so they last longer. (I suppose washing could, sometimes, be a problem for painted ones but I’ve never had an issue). Also, if they don’t fit your decor, or you want a pop of color, baskets can be painted with spray paint, “white washed” any color with a little watered down acrylic paint (absolutely gorgeous pastels and ombre effects!) or dyed/stained with commercial dye, wood stain or even fruit/veggie juices! I love thrift stores and have turned 50 cent baskets, old paint, a couple feet of left over fabric or ribbon into an almost identical replica of what my not so thrifty neighbor bought for $80 – except mine were exactly what I wanted/needed, instead if just being close enough! Also, if you’re lacking floor space they are easy, and lightweight, to hang and use for storage. Hang ones with hinged tops to create instant extra cabinet space for small/light items, or make removable flower arrangement, that can be popped on top and no one will guess your decorative wall hangings are hiding a multitude of clutter! Hope this helps and thanks again for my favorite blog!